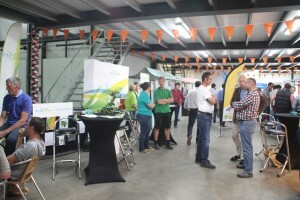 On Thursday 28 June 2018, ZLTO, NFO and Delphy will be organising the 9th edition of The Pear Event, at Vogelaar Fruitcultures in Krabbendijke. The Oude Rijksweg, N289, is the main road from Bergen op Zoom to Goes, parallel to motorway A58. Coming from the direction of Rotterdam/Bergen op Zoom/Antwerp, take exit 31 (Rilland). Coming from the direction of Middelburg/Goes/Terneuzen, take exit 33 (Kruiningen). Parking is available on the designated field of Vogelaar Vredehof BV, opposite Vogelaar Fruitcultures (Fruvo). Parking in the parking spaces of Vogelaar Vredehof BV is not permitted as these are exclusively reserved for staff and costumers. Please follow the directions of the parking attendants. The opening hours for visitors are from 11 a.m. to 9 p.m.
By Mr O. Kavelaars, chairman of ZLTO/NFO, Department of Fruit Cultivation, at 1 p.m. The demonstrations take place under the supervision of Herman Krebbers of Delphy. We offer a guided tour of the demo trials. At the info market, companies and organisations will showcase their products and services.